The firm is cutting pay for 'sleep-in' shifts...while spend on management is set to rise. Care workers rallied across the North West on Tuesday, accusing a controversial care firm of ‘raiding’ their incomes. Unison members at Alternative Futures Group (AFG) are taking action as new figures reveal that AFG’s cuts to care support workers’ pay for overnight shifts is ‘wholly unnecessary’. A sleep-in a where a worker stays in the home of someone they support overnight, and are on-call in case anything happens. Unison say cuts at AFG to sleep-in ‘top up’ payments is costing some staff as much as £2,000 per year. Many of the staff – who are paid minimum wage for their regular hours – are reported to be struggling to stay in the care sector due to not being paid adequately at night. AFG workers’ overnight ‘sleep-in’ pay ranges from £49.98 in Rochdale to £60.73 in Cheshire East. The company receive funding from 15 public authority commissioners across the North West. All but two councils pay more than the £73.89 per shift that would cover the minimum wage rate for staff overnight. 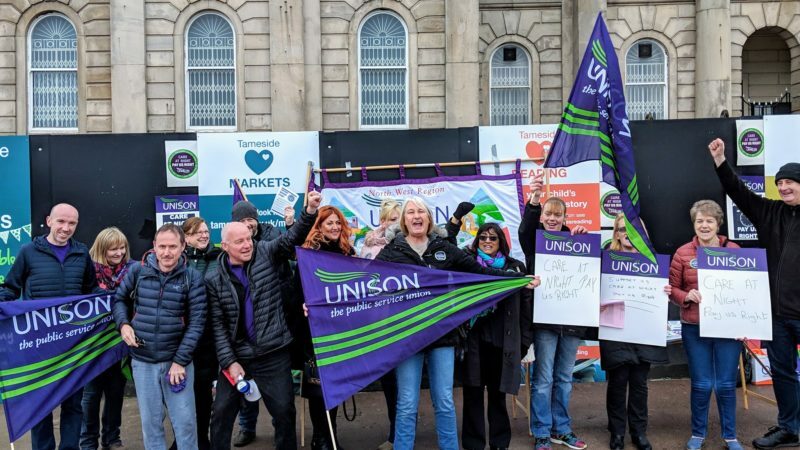 But Unison say the firm takes a 29% cut for themselves before paying staff what is left – far exceeding the cost of non-wage employment costs like National Insurance and pension contributions. Analysis by the union of company accounts shows the organisation has high and rising overhead costs, forecast to go up by 20% over a two year period. The figures show AFG’s executive pay policy cost it £221,000 more this year than if it had matched the industry average, and £547,000 more than if it had chosen to match Mencap’s practice on senior management pay. AFG’s ‘governance and support costs’, which include executive pay, were £7.5m in 2016/17 – and are forecast to reach £9m in 2018/19. Other care providers, with similar commissioning arrangements, pay the minimum wage for sleep-ins – and this is the expected practice of both local and central government. “AFG are taking an enormous cut out of the public money that is intended for the pay packets of low-wage care staff. “They are spending a growing amount on company overheads and they choose to pay their executives more than their competitors do. They have the wrong priorities and they should instead be investing in their front line care staff and in the service. Tuesday’s strike is the third day of three in the latest round of strike action. Last month there was a 48-hour strike and a seven-day ban on sleep-in shifts. Over 660 members were balloted for the strike, with more staff joining Unison since action began. There have been rallies held in Liverpool, Burnley, Rochdale and Ashton and staff took part in a Parliamentary lobby on Wednesday 20 March. The row follows guidance from the government in 2016 which advised that time spent asleep did in fact qualify for National Minimum Wage payments. Although the advice was altered following a series of appeals from care companies, many firms in the sector now pay the minimum wage for overnight shifts. “This Unison claim is a red herring. The real issue for a not-for-profit charity like Alternative Futures Group is the systematic under-funding by central and local government of sleep-ins causing a deficit of £8.1M for AFG since 2015. “Unison is quoting out-of-date information, relating to last year’s accounts, since when the senior management headcount has reduced by two Full Time Equivalent posts. What’s more, AFG pay for every employee was frozen for nine years until April 2018 when everyone received an increase of 2% – hardly ‘raiding staff incomes.’ During this nine-year period AFG Supporter Workers received an average annual National Minimum Wage (NMW) increase of about 3% each year. This is from the Unison website- ” The case taken by UNISON on behalf of Clare Tomlinson-Blake was successful at both employment tribunal (2016) and employment appeal tribunal (2017). But last July the Court of Appeal found in favour of the Royal Mencap Society. UNISON has now been given permission to appeal to the Supreme Court.” Staff are on duty even if they manage some sleep and must be paid at least the minimum wage rate. I’m a commissioner of care services and I know the struggle we have to pay care providers properly… the system is broke! Sleep ins at NMW is not affordable for the country without more funding from Govt! Unions get the story right!